When you contact Barnyard Weed Warriors, we will ask as much about your site as possible, including size, types of plants to target graze, types of hazards (traffic, steep driveways, neighbor dogs) and marshy areas. If you like, we can to a physical evaluation of the property, with an on-site consultation (fee ranges from $175-250 depending on distance). Goat grazing businesses can be found around the country, working for private individuals, businesses, local, state and federal government entities, managing land that include pastures, over-grown city lots, airports, parks, steep slopes and around waterways, where erosion is a concern. Once you contact the Barnyard Weed Warriors, we will find out as much as possible about the area you would like us to work. We can visit about your plans for the area as well as how we plan to ‘attack’ the vegetation. When we arrive on site with the 75 goats, to begin the work, we will set up temporary electric netting fences and turn the goats loose to have their way, with your weeds! Goats have a very high metabolism, so they are always hungry, or so it seems. They can eat up to 5% of their body weight a day in leaves/weeds/brush (can you imagine 5-8 pounds of leaves in a pile?). Goats are in the same Order of Animals as alpaca, cattle, camel, deer, llama & sheep, so they are ruminants, which mean they have a multi-chambered stomach that includes the rumen, reticulum, omasum and abomasum and they chew their cud. Because goats are similar in nature to deer, they prefer weeds, woody plants & brush over grasses, but they will eat grass in the grazing areas if all the tasty weeds are eaten. Goats are much smaller than cattle, so they have a very low impact on the ground, making them perfect to work sensitive area subject to erosion and run-off. 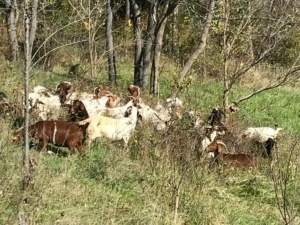 Goats will eat most weeds, brush and invasive trees that can be found in Kansas and Missouri. Some of their favorite treats are, Buck Brush, Blackberry, Sandhill Plum, Kochia, Honey Suckle, Sericia Lespedeza, Osage Orange, Thorny Locust, Poison Ivy & Oak, Bindweed, Johnson grass, Elm trees, Dandelions and Firebush. MYTH BUSTER- Goats do not eat tin cans! They will eat paper and cardboard, which may not be good for them. Goats do NOT eat everything. There are some plants a goat will not or cannot eat. At certain times of the year, some plants are not as tasty to the goats or they are toxic to the goat. Some dangerous plants include Jimson weed, Larkspur, Nightshade, Cherry, Choke Cherry, Sudan Grass, Milkweed, Maple trees & leaves and Cocklebur. *Goats do occasionally eat things they are not supposed to eat but it doesn’t always make them sick. A little of a bad thing, won’t bother them for the most part but also, the plants that are good for them can also make them sick, it is a matter of how much or how little they eat and ONLY the goat knows their limits…sometimes. Goats are small enough in size that they have little impact on the ground they are working. Their tiny feet aerate the soil and their ‘goat berries’, which are easily degradable are a great way to fertilize the soil with essential nutrients and organic matter. The goat is a very agile animal, loves to climb on rocks and steep slopes, allowing them to navigate areas that are difficult for machinery to work. Seeds ingested by goats are often denatured, so they cannot germinate and that slows down the re-seeding of noxious weeds. Goats are also fun to watch as they move around eating, climbing and playing. Barnyard Weed Warriors uses electric netting temporary fencing. Each roll is 164 feet long and 42 inches tall and has pigtails on each end to clip together with the next roll of fencing. The fence is then electrified by a solar fence charger. Barnyard Weed Warriors has daily, weekly, monthly & subscription rates and are willing to do pilot programs, benefits and other special events that include the goats. Mary is on site with the goats 24 hours a day,unless she needs to get supplies. If she does need to leave, it will be for a very short time and will notify the customer before she leaves. BWW supplies the first 300 gallon of drinking water and the customer is asked to supply additional water for Mary, the dogs & goats, if we are working in hot weather. We also ask the customer to inform Mary of any weather dangers and provide contact information for the local law enforcement, for emergency services. Visitors to the work site are welcomed from 8 AM to sunset.